Spotify hell! 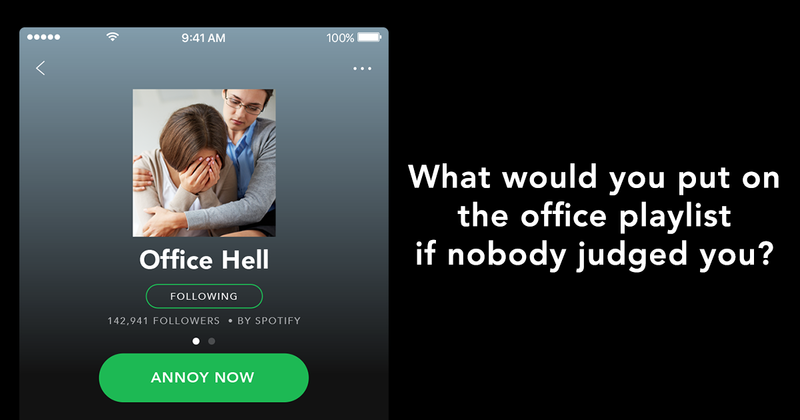 What would you put on the office playlist if nobody judged you? At Bright Signals, we always like to ask the big questions. The ones that really matter. The ones that tell you everything you need to know about a person’s character. That’s why we recently asked our team which songs they’d add to our office Spotify playlist if they were going to be subject to absolutely no judgement or mockery. Having seen the responses, it turns out that a little judgement is actually a very necessary deterrent. In fact, it’s probably the only thing keeping us safe. He says: As a teen of the early noughties, I’ve never really grown out of my obsession for 00s nu-metal. This is a more recent example that I love – although it’s arguably more ‘metalcore’. We say: This is less Cake By The Ocean and more Coke By The Ocean. He says: Don’t Stop Believin’ by Journey. When I first started Bright Signals I had a weird ritual where I’d play it whenever a client paid an invoice. This lasted about three weeks but it was fun while it did. We say: This is ironic, right? David? David…? He says: Because it’s a stomping anthem for the millennial emo youth I never had because I was too old. We say: If Busted had worn guyliner. He says: Because it’s one of the greatest pop songs ever recorded. I don’t care if people judge – I’m 100% stone cold correct on this one, and I am happy for this to be the hill that I die upon. We say: Few things sum up the harsh desert surroundings and culture of lawlessness that faced settlers in the Wild West like the lines, “Uh, wicky wild wild, Wicky wicky wild, Wicky wild, wicky wicky wild wild wild west”. Tom, we’ll make sure we leave a fitting memorial on that hill. We say: We were about to mark this as a straight ‘unacceptable’, until office-dwellers of a certain age reminded us that Clannad did this theme to the 1980s Robin Hood TV series, ‘Robin of Sherwood’. She says: Memories of sitting in the back of the car on long journeys as a kid and having the great anthology of Roxette’s back catalogue blaring out the cassette player. I know ALL the words. To ALL of them. Do not try me. We say: Well, they’re one of the top two groups to come out of Sweden. Unfortunately for them, the other one is Abba. So top two is as good as it’s ever going to get. He says: No need to explain that the office wifi is fine and that it’s meant to sound like that. We say: Like science has found a way to distil seasickness into a sound. He says: Any song by Motley Crue… Huge nostalgia from my childhood days and pretty much all the bands members had a lot of success outside of Motley Crue, which is inspiring. We say: That hair just looks like it would shed all over the stage. If only there’d been a poodle-crossed, hypoallergenic version. Motley Croodle. He says: I first encountered Bongwater, aged 15, on a pirate C90 cassette my dad’s friend brought back from America. I was fascinated by everything about them from the lyrics to the record label, Shimmy Disc, set up by Penn & Teller collaborator, Kramer. Their music led me to spend extortionate amounts on importing the Shimmy Disc back catalogue via Tower Records (in the days before Amazon), then later on a pilgrimage to New York and the East Village where many of their songs — or more accurately stories — are set. Definitely an acquired taste. We say: This is like you’ve been awake for 3 days and have finally fallen asleep in an East Village cafe. During a slam poetry competition. The resulting nightmare haunts you for eternity. He says: ‘Deep Burnt’ by Pepe Braddock. A deep house classic and the song to play if anyone ever needs an answer to the question ‘What is deep house?’. Not a massively well-known record but has often been the benchmark for me as to whether a party / club night / festival set goes from ‘Good’ to ‘Next level good’. Basically, if I hear anyone play it, I know they know what they’re doing. We say: The question isn’t what is deep house, the question is why is deep house? He says: I remember getting to stay up late one Saturday night and watch the movie, Kelly’s Heroes. It’s still one of my favourite movies now and I must have seen it at least a dozen times. Donald Sutherland as Oddball is fantastic… but anyway. This is the theme tune from the movie, composed by Lalo Schifrin (who also did the theme from Bullitt). Whenever I hear it, I just want to get a bunch of people together and rob a bank located deep behind enemy lines. Because morally that’s kind of OK, isn’t it? Like if you did take candy from a baby, but the baby was Damien from The Omen? Also, I’ve just discovered that someone’s set the music to scenes from Star Wars: Rogue One! We say: Bridges burnt. Musical tastes worthy of getting the Bullitt. Have we put you off yet? You’ve made it this far, so we have to congratulate you on your resilience. Though to be honest, we’re still not clear on whether you’ve made it through this list because you’re someone who loves music… or somebody who hates it. Fair’s fair though. We’ve shared our musical horrors with you, so we think you should let us in on your own guilty secrets. Why not drop us a line? Oh, and if you’d actually like to work with us too, then we’d be up for that as well. Either way, we respond to emails, tweets, calls and the alluring rustle of chip paper.